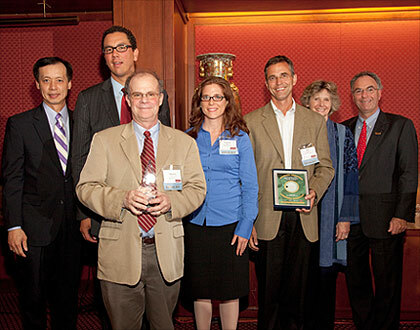 (Center, front row, from left to right) FlexEl award winners Prof. Martin Peckerar, Karina Drees, and Bob Proctor pose at the 2010 Maryland Incubator Company of the Year Awards ceremony in Baltimore, Md. Also pictured, back row, left to right: Benjamin Wu, Maryland Department of Business and Economic Development (DBED); Christian S. Johansson, Secretary, Maryland DBED; Barbara Dreyer, President & CEO, Connections Academy®; John M. Wasilisin, Acting President and Executive Director, TEDCO. Photo by Tracey Brown. FlexEl LLC, a company created by ECE faculty that is currently developing rechargeable, flexible, thin-film batteries, was named company of the year in the technology transfer category at the 2010 Maryland Incubator Company of the Year Awards, held June 15 in Baltimore. FlexEl, a participant in the Maryland Technology Enterprise Institute (Mtech) Technology Advancement Program (TAP) incubator, was selected among 22 finalists. FlexEl is commercializing a flexible, ultra-thin battery with a thickness comparable to a business card. The batteries have higher storage capacity than any other battery available today, are non-toxic, and can be recharged wirelessly. University of Maryland Electrical and Computer Engineering (ECE) Professors Martin Peckerar and Neil Goldsman, along with research associate and ECE alumna Zeynep Dilli and ECE Ph.D. student Mahsa Dornajafi, developed the company’s patent-pending technologies. • Omnispeech LLC is developing speech extraction technology for cellular and other communications. Omnispeech’s technology solves a major problem—background noise in cell phone conversations—with cost-effective software, while current solutions require bulky, cost-intensive hardware. The company won the high tech category in the 2010 UM $75K Business Plan Competition and is currently in the VentureAccelerator program. The company was founded by ECE Professor Carol Espy-Wilson. • Resensys LLC develops self-powered, energy-harvesting, wireless, distributed sensors for monitoring structures such as bridges, buildings, and pipelines. The company's patent-pending technology, invented by electrical and computer engineering assistant research scientist, telecommunications faculty member, and alumnus Mehdi Kalantari, will detect strain, deformation, and cracks forming in structures, and provide early warnings when problems arise. Resensys' sensors attach to existing structures. Resensys won the high tech catetory in the 2008 UM $50K Business Plan Competition and graduated from VentureAccelerator to TAP in March 2010.